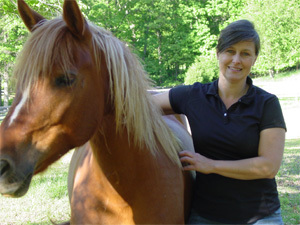 I am Paige Poss, the owner and creator of Iron Free Hoof. I started trimming in 1999 and even after almost 20 years of trimming, I still love what I do! I had no idea the simple act of picking up a rasp, having the courage to try and studying hard would change my life. In 1999, I dragged home a horse that had hoof problems. I was a stay at home mom with young kids, little to no money or knowledge to manage a horse with laminitis, but I had time and tenacity. I've had horses my whole life. When I was young, my grandfather encouraged me trim my own ponies. I got pretty good at making the feet look pretty, so I wasn't intimidated to use tools. I pulled the shoes and began trimming the laminitic gelding I owned. Within a very short amount of time, he was significantly better, and I had found a new passion. 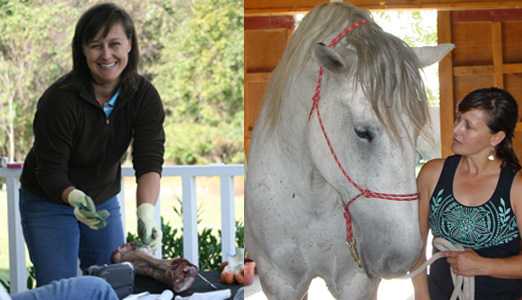 Fascinated by the results I got from my gelding, I began studying extensively and trimming any horses in need (More like any horse that would stand still long enough). The more I learned, the more enthralled I became. I look at the feet from many different aspects and incorporate all that I have seen. My goal and joy is to compliment the knowledge base that is out there and add a fresh perspective. I love increasing people's confidence and promoting critical thinking. My trimming practice and my website is where I blend my interests. The mechanical hoof issues integrate my love of working with tools and simple construction. My artistic side is involved with the actual trimming and hoof photography. Trimming is a wonderful field that incorporates my degree in Animal Science from North Carolina State University and work experience as a research technician working for talented and highly regarded scientists in biotechnology, toxicology, physiology and nutrition. I am also active in Pacific Hoof Care Practitioners. Their Mission is to provide a supportive network and educational foundation for hoof care professionals and horse owners based on a holistic and progressive approach. I am a member of American Association of Professional Farriers. The primary focus is Continuing Education for all professionals in our industry. We encourage professional farriers to attend clinics, seminars, contests, and other educational events to enhance their profession. I was a founding member of the American Hoof Association. This non-profit organization is the brainchild of Pete Ramey. He saw the need to organize a comprehensive group of professional trimmers who adhere to a conservative, non-invasive approach to trimming. In Sept. 2017, I left my beloved Virginia and set out on a new adventure in a whole new land....Tucson, Arizona.